Carolina Silver And Gold LLC address, phone, website, hours of operation, and more. We began our foray into numismatics in the most basic type of collecting-US Pennies. Over the next 30 years this slowly evolved into US Silver and Gold coins, Currency, Treasure Coins, Artifacts and World coins-specializing in Central and Latin America. We became full time dealers in 1990 and have remained focused on this exciting and challenging industry, becoming known world wide for our expertise. 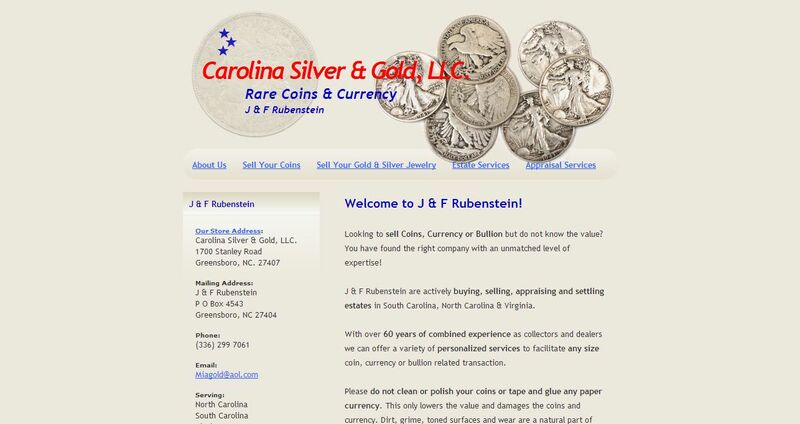 The purchasing of coins, currency and bullion in South Carolina, North Carolina & Virginia became an out growth of our business in 2002. So many referrals from local friends, law firms, banks, and auctioneers convinced us that there was a need for a more personalized way to sell coins, currency and bullion. We have a client based philosophy based on experience; we treat every buyer or seller with an unbounded level of service. We guarantee customer satisfaction.